For something truly bespoke, designs can be customised to your own requirements. I often work to commission creating customised pieces. I feel very privileged to have created many pieces over the years to celebrate or commemorate big life events such as engagements, wedding and anniversaries. I take great pride in my work and it means a great deal to me that the pieces I create will be treasured for years to come. 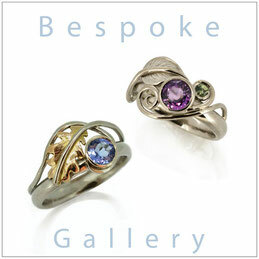 I hope the links to the pages below will give you a good idea of what bespoke is all about. I hope the 'Go Bespoke', 'Commission Process' & 'Bespoke Gallery' pages have been of help. If you would like to discuss a commission, please do not hesitate to get in touch via the 'Bespoke Enquiry Form'.